Paige's Page: KIngsisle Players raise 100,000 for Charities! KIngsisle Players raise 100,000 for Charities! PLANO, Texas, Jan. 23, 2013 Due to the extraordinary generosity of Wizard101 and Pirate101 players, KingsIsle Entertainment will donate a total of $100,000 to two Texas charities devoted to helping children. The donation is part of KingsIsle's ongoing commitment to make a positive difference in the communities where the company and its employees are based. 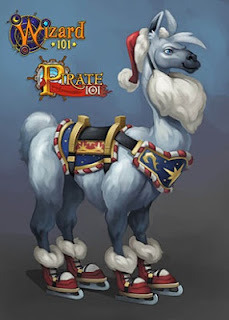 To raise the funds, KingsIsle created a special holiday charity item, a festive Fa-La-La-La Llama mount, and made it available for purchase in both Wizard101 and Pirate101. "This year, with the launch of Pirate101, we decided to up the ante and double our contribution goal to $100,000," said Elie Akilian, chairman and CEO of KingsIsle Entertainment. "Today, we're pleased to announce that we achieved that goal. This brings KingsIsle's total charitable contribution since the launch of Wizard101 to over $326,000 - all going to children's charities in Texas and around the country." Tales of Mina De Bouff- The house visit.